In the classic movie The Christmas Story, there is a Christmas morning scene where all the presents have been opened – wrapping paper is thrown everywhere, the room is littered with toys and gifts, and mom and dad are reclining on the sofa while little Randy and older brother Ralphie play with their new toys. Everything is bliss, except for one nagging thought in Ralphie’s mind – he didn’t get the Daisy BB gun he wanted so badly. But that didn’t deter little Ralphie. He still wanted that BB gun more than anything. And sure enough, there was one present back behind the tree that his father pointed out to him. It was the right size, the right shape, and as he ripped the wrapping paper off, Ralphie’s dream gun was finally in his hands. And his father was nearly as happy as he was, trying to stop from smiling from ear to ear as Ralphie was beside himself with excitement. Those of us who are familiar with the movie know what happens next – Ralphie goes outside to try out his new gun and a BB ricochets off the target and hits him in the eyeglasses, shattering them. Poor Ralphie had shot his eye out, just as everyone had predicted. Which begs the point, didn’t his father know that might happen? He must have, as his wife didn’t seem very approving of the gift, as if they had discussed it. And yet he gave his son a BB gun anyway. Whether right or wrong, good judgment or bad, the father wanted to make his child happy. And that is our heavenly Father’s heart towards us. He wants to make us happy. Even better, our heavenly Father knows what is best for us and has far better judgment than our earthly fathers. Our earthly fathers did what they could to give us good gifts and make us happy, although many times they likely fell short. And, unfortunately, some dads weren’t there at all for their kids and the pain of that absence still lingers in the hearts of their children today. Whatever the case, whether our earthly fathers were good gift-givers or not, let’s rest in the love and good judgment of our Heavenly Father today. He knows not only what we need, but also what we want. He knows what will give us great joy, and He knows what will leave us feeling empty and let down when the glitter rubs off and the wrappings hit the floor. He knows what bring lasting happiness and what gives pleasure only for a moment. So go to your Heavenly Father and ask for your heart’s desires, knowing that He loves you unconditionally and He will provide those things that will bring you true joy and lasting happiness. Don’t worry if your dream is too large or too small – his resources are limitless and yet he cares about you and the smallest details of your life. 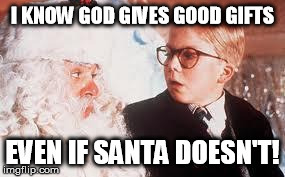 Just go to Him and talk to Him, much like Ralphie did when he wanted a BB gun. Your request doesn’t have to be smooth, well-planned, or eloquent; it just has to be heart-felt. And then be ready to receive more than you asked for because our Father knows how to give good gifts to those who ask Him. In fact, be ready to receive God Himself, as in Luke 11:11-13, Jesus says these same words with a twist – He promises that our Heavenly Father will give the Holy Spirit to those who ask Him! So ask Him today, right now. Ask for good gifts, for your heart’s desire, for the Holy Spirit to come and live inside you. God Himself – in the form of the Holy Spirit, the breath of God – will come and take up residence in your innermost being. He will be a part of you in a way that He never has before, and He will lead you into all truth, every good gift, and every desire of your heart that lines up with His will for your life. After all, not only does He love you with an undying love, He also knows you better than you know yourself. So don’t hesitate, don’t be afraid to ask for too much or too little or for the wrong thing. Just keep asking, keep seeking, keep knocking, knowing that you can trust Him to give you what is best for you. He knows how to give good gifts, and it is His delight to give you the Holy Spirit – His presence living inside of you. Luke 11:11-13 "Which of you fathers, if your son asks for a fish, will give him a snake instead? Or if he asks for an egg, will give him a scorpion? If you then, though you are evil, know how to give good gifts to your children, how much more will your Father in heaven give the Holy Spirit to those who ask him!" John 14:15-21 "If you love me, you will obey what I command. And I will ask the Father, and he will give you another Counselor to be with you forever—the Spirit of truth. The world cannot accept him, because it neither sees him nor knows him. But you know him, for he lives with you and will be in you. I will not leave you as orphans; I will come to you. Before long, the world will not see me anymore, but you will see me. Because I live, you also will live. On that day you will realize that I am in my Father, and you are in me, and I am in you. Whoever has my commands and obeys them, he is the one who loves me. He who loves me will be loved by my Father, and I too will love him and show myself to him." John 14:25-27 "All this I have spoken while still with you. But the Counselor, the Holy Spirit, whom the Father will send in my name, will teach you all things and will remind you of everything I have said to you. Peace I leave with you; my peace I give you. I do not give to you as the world gives. Do not let your hearts be troubled and do not be afraid. Rom 8:31-32 What, then, shall we say in response to this? If God is for us, who can be against us? He who did not spare his own Son, but gave him up for us all-how will he not also, along with him, graciously give us all things? Eph 1:17 I keep asking that the God of our Lord Jesus Christ, the glorious Father, may give you the Spirit of wisdom and revelation, so that you may know him better. To be a part of the conversation about the article above, or even if you just want to read what everyone else is saying about it, go to the God Gives Good Gifts Comments Page. This article is Day 38 of the 40 Day Devotional; the next devotional is Day 39.